The plan was to spend the morning on nice roads again, visit the Algarve and then take the motorway into Spain to get to Jerez as fast as possible. 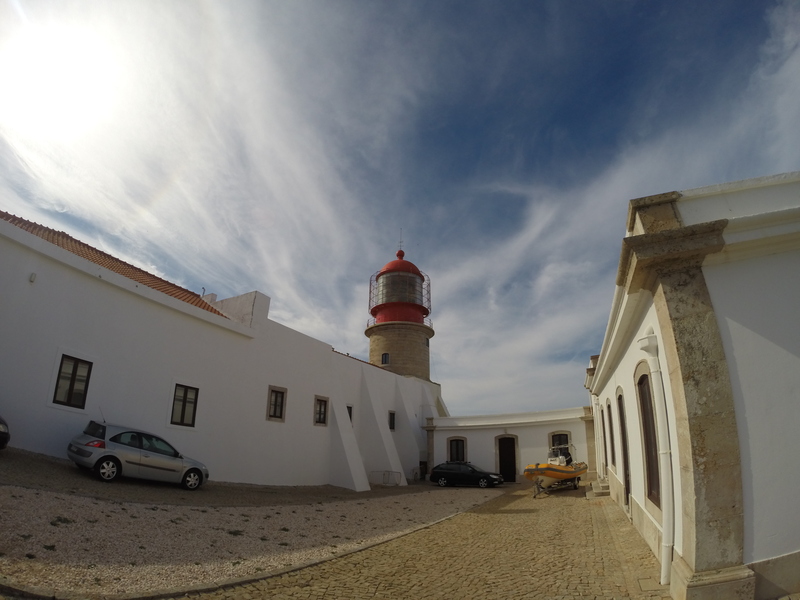 I first visited the lighthouse in Cabo de Sao Vicente. It is right on the most southwestern tip of Portugal, and even though it is not particularly more beautiful than anything I had seen on the previous day, the place showed more signs of tourism than anything on the coast I was coming from. There was a hotdog stand in the car park by the lighthouse, and there was a constant stream of coaches dropping big groups of tourists armed with selfie sticks and ready to take their pictures with the coast behind them. Next stops were Sagres and Portimao, which were even more touristic – lots of apartments, traffic everywhere… I was not really enjoying this part of the route, and I started to have doubts about taking the detours from the main route that a visit to Albufeira and Faro required. In the end, and seeing that it was getting late, I decide to stick to the inland route, and I did not regret my decision. To me, Algarve was at its most beautiful there, lush green hills, little villages, no traffic, great roads… I had a wonderful ride, including a stop in a restaurant at a small village for what turned out to be the cheapest meal of the whole trip. Near Tavira the estimated time of arrival that the GPS was giving me to Jerez was becoming too late, so I decided to finally get on the motorway for the rest of the ride. There would be a relatively straight line along the coast to get to Jerez, but there is the Doñana National Park in between, which meant a long detour via Sevilla. After almost 300 km of sheer boredom I rode into Jerez and followed the GPS instructions to the hotel. It was half past seven and the streets were oddly deserted. A few minutes later I found out why. Thursday was the first day of the Easter holidays in Southern Spain, and for those of you who have not visited this part of the country, this is a religious holiday period that is celebrated in a big way here. There are religious processions at different times of the day, especially late evening and night, and that was where everyone was – in the city centre watching of these processions walk past the entrance of my hotel. I got as close as possible to the street where my hotel was, but the police had cut access to the area; I tried to talk to the police officer and convince him to let me park the bike a bit closer to the hotel, but there were a lot of cars trying to get around the area and he had no time for me, so he just waved me off. The only useful bit of information I got from him was that the streets were going to be cut for the next hour and a half to two hours, so I decided to go to the airport and have a coffee and read my book to kill the time until Nat’s plane landed. Fat chance… Jerez airport was tiny, and unlike Barcelona, there was nowhere to park the motorbike for free, so I made up my mind to try to approach the hotel from a different street in the hope of running into a more understanding police officer. This time I was luckier, and they let me park the bike on the other side of the police barrier so I could take my stuff to the hotel on foot, check in and then park the bike somewhere else. Anyway, with all my coming and going and trying to get to the hotel it was already time to go back to the airport and pick up Nat, so there was no time to shower, shave or change, I offended a few more grannies getting back to the motorbike and rode to the airport, the sky already dark. She was coming straight out of work and was delighted to finally be on holiday, we rode back to the hotel, and by this time the procession was finally over, so not only were we allowed to ride much closer to the hotel, we could also access the entrance to the car park. After a well-deserved shower, we hit the streets in time to have some delicious tapas and enjoy some local wine before the next procession got underway. They lasted all night, the last one still packing up as I was taking the bike out of the car park the following morning. This entry was posted in Portugal and Southern Spain 2015, Travel and tagged Algarve, Cabo de Sao Vicente, Jerez, Portimao, Sagres by Kilian. Bookmark the permalink.